For forty-four years, The American Artisan Festival event has brought artists from around the country together in Centennial Park with the mission to make art more accessible. By providing direct access to artists, Nashvillians then get to take the time to learn about their art, their process and enjoy collecting art in a whole new way. It is tactile, it enables personal connections, and it is fun! Last year for our 2017 event, The American Artisan Festival added a powerful site specific public art installation entiteld GROW LOVE by visiting artists Tracy Ginsberg and Theodore Lillie of Forest Alchemy. As we looked at this year, we all fell in love with the idea that our visitors can also continue to have sculpture or site specific experiences that elevate the experience of visiting Centennial park. Therefore, this year, sculptors, builders and installation/live artists were invited to create something new to the annual tradition. We’re thrilled to be working with both Beth and Brett this year to create unique site specific installations that will be found within the footprint of The American Artisan Festival. Rather than explain the works in detail, you’ll just have to come and see them for yourselves! 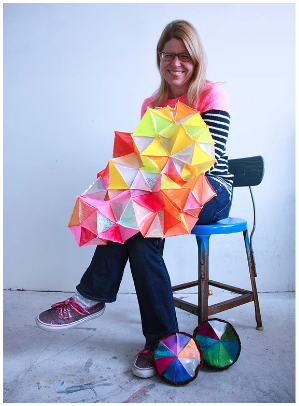 Beth Reitmeyer is a visual artist based in Nashville, TN who likes to make people happy with her colorful installations. Beth was born in Colorado Springs, CO and raised in Louisville, KY. She attended Northwestern University (MFA), The School of the Art Institute (Post Baccalaureate program), and the Pennsylvania State University (BFA). Her sewing skills and love of glitter were learned from her mother. Beth's work has recently been exhibited at The Elizabeth Foundation, New York, NY; ArtMATTERS, Bowling Green, KY; Seed Space, Nashville, TN; Ground Floor Gallery, Nashville, TN; the Kentucky Library and Museum, Bowling Green, KY; Zg Gallery, Chicago, IL; Ground Floor Gallery, Brooklyn, NY; Institute of Contemporary Arts, London; abrasiveMedia, Nashville, TN; BOX13 ArtSpace, Houston, TX; The Ragdale Foundation, Lake Forest, IL; goldenPARACHUTES, Berlin; ArtWorks, Cincinnati, OH. This past summer, Beth was an artist-in-residence and instructor at The Ragdale Foundation, Lake Forest, IL. Beth moved to Chicago for school and lived there for 15 years. Five years ago she returned to the south to be close to her sister who is raising three children; Beth's two elementary-aged nephews are on the autism spectrum. She has been trained in Applied Behavior Therapy (ABA) for autistic children, and it made sense for Beth to come to Bowling Green, KY to work with her nephews since early intervention is key. Beth also teaches with Turnip Green Creative Reuse, training and nurturing the next generation of artists. Brett Douglas Hunter is a self-taught artist living and working in Nashville, Tennessee. Originally from Illinois, he comes from a family of self-propelled artists and builders, seemingly destined to be a maker from the start. He dove head first into the world of sculpture, making weird and wonderful creatures using fibrous concrete mixture. He most recently had a solo show at Julia Martin Gallery, and did a residency last February at Alex Lockwood’s Elephant gallery, where he spent a month creating a mixed-media wonderland.